NOW: The “Just Wondering” blogger Matt the Journeyman, stands in the “now” at the northwest corner of Seneca and Second. One block north on Second the charming four stories of the Brooklyn Building at the southeast corner with University survive from the “then” into the “now” although they are were hidden behind the street trees when Jean visited the site last fall. 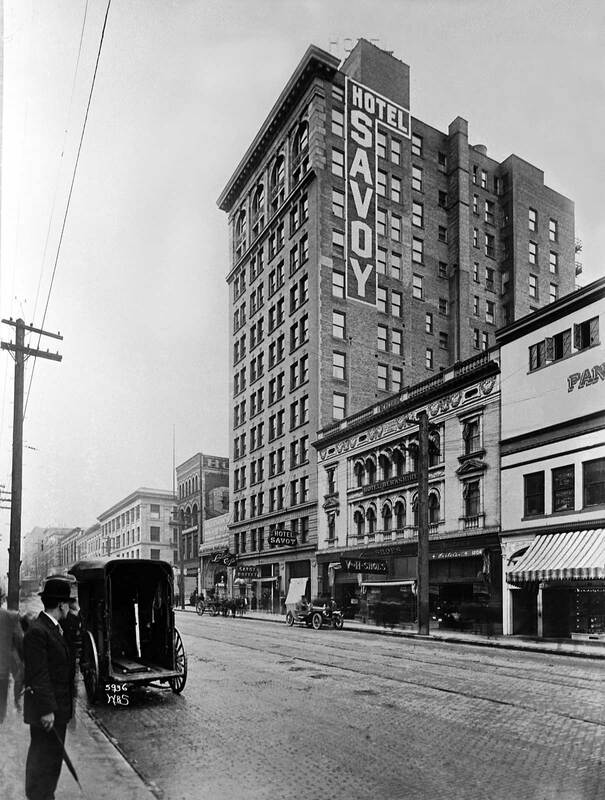 The lifting of the Savoy Hotel in 1905-06 helped advance Second Avenue as Seattle’s urban canyon of steel-framed high rises. The Alaska Building at Cherry Street was first in 1904. The Empire Building went up at the southeast corner of Madison Street only a few days behind the construction schedule of the Savoy. (In the late 1970s the Empire was the first of Seattle’s skyscrapers to be spectacularly razed by implosion.) Together the Standard Furniture Building (Broadacres) in 1907 at Pine, and one year later and one block north at Stewart the New Washington Hotel (Josephinum) gave the canyon its northern pole. The completion of the Hoge Building in 1911 at 17 floors gave a momentary crown to the canyon at Cherry. But three years later the Smith Tower at Yesler was dedicated with a mysterious 42 stories. still disagree on what counts as a “story.” All Second’s “scrapers” except for the Empire and the Savoy survive. 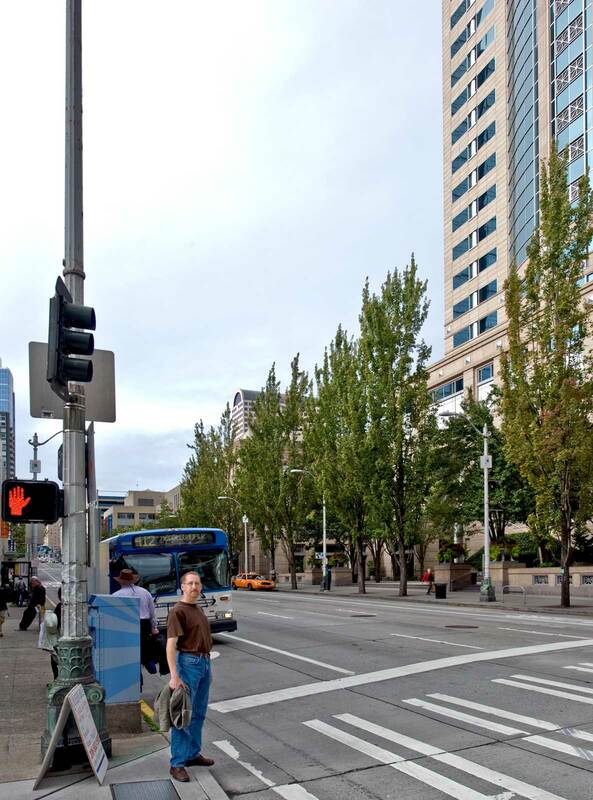 The Savoy’s planners could not have known in 1904 that its position mid-block between Seneca and University Streets would eventually strand it between the new retail district around Pike and Pine and the old Financial district closer to Pioneer Square. But they did soon determine that the height of their slender Savoy was by comparison to the others a mediocre high rise. Here I introduce the bright blogger Journeyman Matt and his blog “Just Wondering.” Mat advised me of the Savoy’s height “anxieties” when he revealed that the hotel was first built to a mere eight stories but then quickly cranked up to “Twelve Stories of Solid Comfort.” Next, working together we illustrated the brief history of its growth, which you can follow on his blog. A few somethings Jean. I searched through the list of now nearly 29 years of doing now-then for Pacific and found a half dozen stories that related to the close neighborhood of the Savoy. However, for the moment, I found the illustrations for only four of them, and I’m including here three of those. Two of them feature parades: one for bikes and another for elephants. I’ll put them down now as time allows before I put myself down tonight. I’ll proof them in the morning. Looking south on Second towards its intersection with Spring Street. Courtesy Lawton Gowey. On February 18, 1901 a local bicycle merchant, Fred Merrill, staged a media event.. He aroused the community and startled his competitors with a peculiar parade up Second Avenue, then Seattle’s Bicycle Row. Cameron is pictured here in the contemporary photograph. (When we can find the negative we will replace this screened rendering grabbed from the book “Seattle Now and Then” that you can visit in toto on this blog.) The location of the “now” image is the . same as the “then” – one half block north of Spring Street on Second Avenue. Cameron poses as part of a different sort of bicycle delivery: 15 bikes and riders from Bucky’s Messenger Service. The deliverers pedal a total of 500 miles a day, courageously darting through traffic that’s not always willing to share the road with bicycles. Cameron is Bucky’s repairman. He is a complete cyclist: rides them, repairs them and researches them. 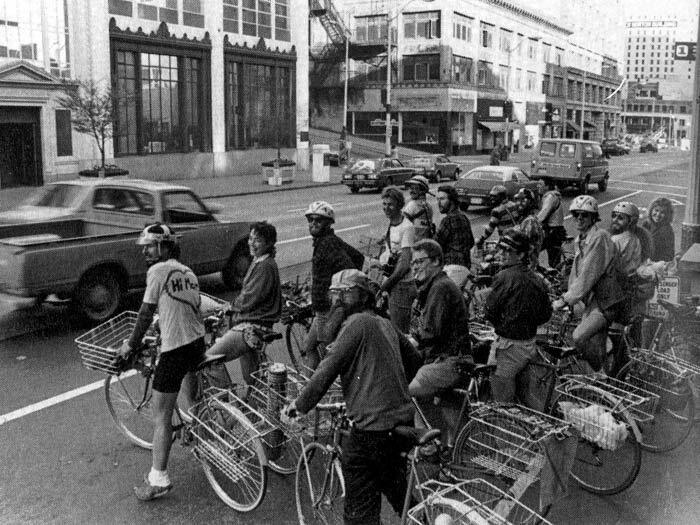 Bucky's Bikers on Second Ave. in 1982. Cameron is closest to the camera. 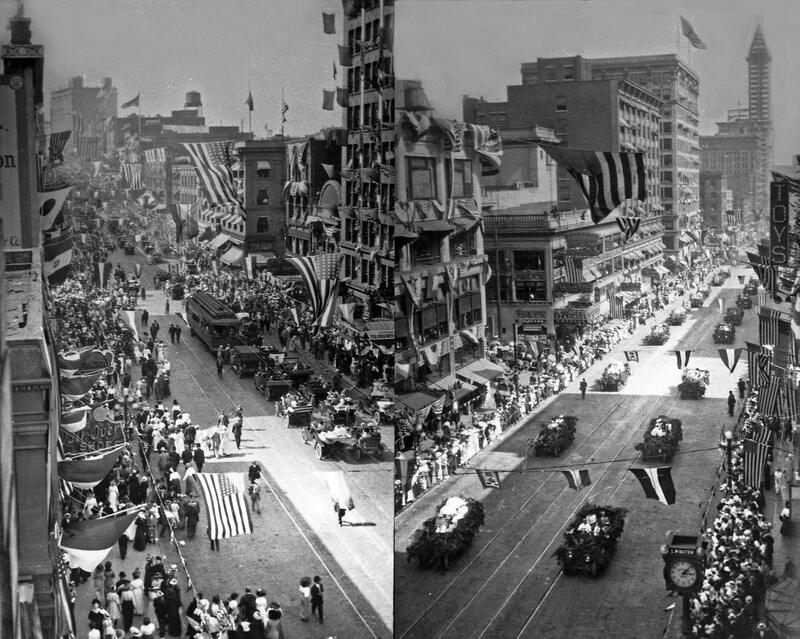 The historical photograph shows a part of the parade, and that may be Merrill in the lead carriage at the far left. 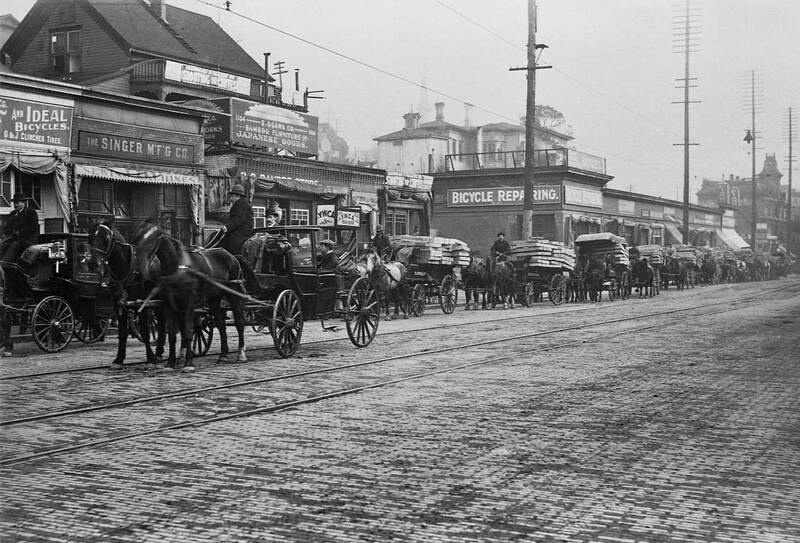 The carriage pauses beside his storefront with the sign for “Ideal Bicycles” to pose with a few of those hired wagons for an unidentified photographer. In 1901 there were more than it dozen bicycle shops on Second Avenue between Marion and Pike Streets. No doubt in February they were all preparing for the spring rush on two wheelers, but none with the showy delivery of the man in the rented carriage. The city’s first bicycle was brought from San Francisco in 1879 by the book merchant W.H . Pumphrey, for the son of a local bookkeeper named Lipsky. Little Lipsky’s toy required the resilience of youth because the ride was very bumpy. The tires were hard, there were no brakes and, of course, no paved streets. The flexible pneumatic tire, and a softer ride, first arrived in 1893; in time to test the city’s first paved surface, an experimental block of bricks on First Avenue South between Washington Street and Yesler Way. By 1896 there was still only one mile of paved streets in Seattle, including these (above) Second Avenue bricks supporting Merrill’s parade. Cameron estimates that in 1896 there were only about 300 cyclists in Seattle. One year later there were 3,000. In 1897 your first desire was to strike it rich in the Klondike, but you might settle for a bicycle. And all those cyclists formed an effective lobby. The Queen City Cycle Club was founded in the Argus (a long-lived weekly tabloid) offices in 1896 and a year later it became the Queen City Good Roads Club. The Argus ran a regular bicycle column, which promoted the “wheeling” scene. With funds from licenses, benefit races and pledges, bicycle paths were built first around Lake Union and then through a scenic 10 miles to Lake Washington, a portion of that path is today’s Interlaken Boulevard at the north end of Capitol Hill. By 1901, the year of Merrill’s parade, there were more than 10,000 local cyclists. Many wore bloomers, named for “the rational riding costume” for women. Bicycle racing for men and women was a popular sport, and the city’s planked and cindered tracks were busy with both local contestants and touring professionals. Club retreats took off on weekends for West Seattle, Edmonds, Snoqualmie Falls – even Tacoma. Some bicycles were manufactured locally. This city was also an exporter and a few of Merrill’s 400 Ramblers were bound for China, Japan and even the gold fields of unpaved Alaska where the buyers expected to cycle to their nuggets and perhaps even over them.. The bicycle bust followed the boom. By 1907 what Cameron calls the “decade of the bicycle” was over. Of the 23 merchants that sold cycles during the boom only two remained in 1907. Many dealers went on to automobiles. The sales were less seasonal and the buyers, though often out-of-shape, were usually well-heeled for putting their leather to different pedals. Looking north on Second towards University Street and the Brooklyn Hotel at its southeast corner. The Denny AKA Washington Hotel is on the left horizon of Denny Hill. The circus parade was a great spectacle and promotion, an anticipated annual ritual in many city’s and towns across the county, and often it would also serve to move the circus from the railroad depot to the performance site. That may be what’s happening with this Ringling Bros. procession on Second Avenue, looking north from Seneca Street around noon on a sunny summer day. Local circus enthusiast Michael Sporrer describes this as “one of the few Seattle photographs that is really good on elephants.” (I count a dozen – elephants, not photos with them.) 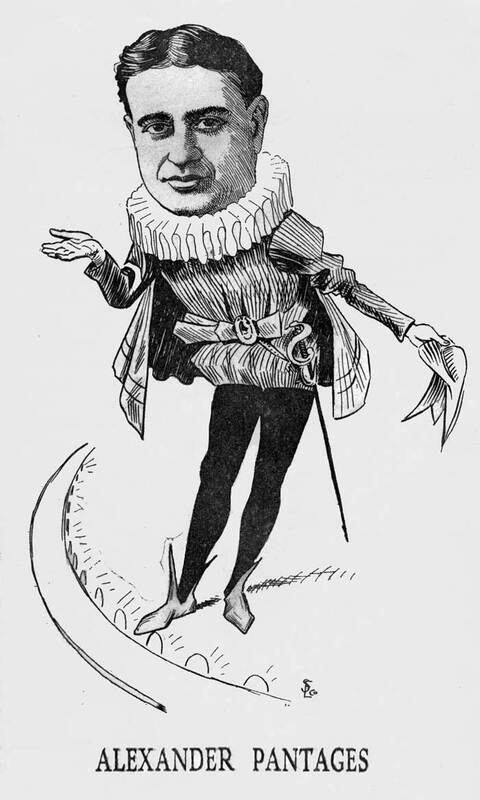 In Sporrer’s cataloging of Northwest circus appearances (a decades-old unpublished work in progress) he has Ringling Bros. here for two-day stands in late August 1902, ’03 and ’04. 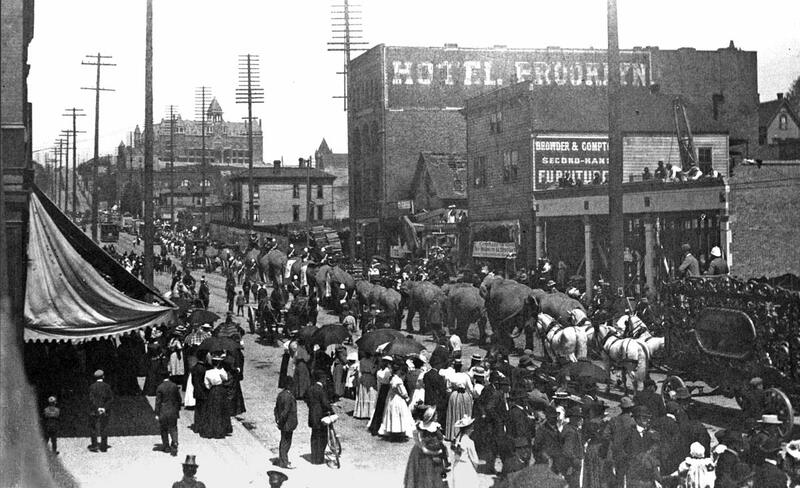 Since the most popular early-century Seattle venue for circuses was the old ballpark on Fifth Avenue North at Republican Street (now the High School Memorial Stadium) these elephants may be en-route from the waterfront train depot to the fields of Lower Queen Anne. Both First and Second avenues were then preferred routes to Queen Anne and North Seattle. Third Avenue stopped at Pine Street, one block and 100 feet below the front portico to the Victorian Denny Hotel atop Denny Hill. Here, this looming landmark interrupts the left -horizon. To the far left Second Avenue still climbs the western slope of Denny Hill, so this view probably dates from 1902 or even 1903, when the Second Avenue regrading began, which in two years lowered it to its present grade. By 1910 the regarding would raze Denny Hill (including the hotel) as far east as Fifth Avenue. George Bartholomew’s Great Western Circus was, according to Sporrer, the first real circus to visit Seattle. It came overland from Virginia City, Mont. in 1867-by wagon. By Sporrer’s accounting, the last real full-blown circus parade to trek through downtown Seattle probably was the Cole Bros. Circus procession in 1937. The last big tent show hereabouts was Circus Vargas’ 1988 performance in Renton. Looking northeast through the intersection of Seneca Street and Second Avenue. 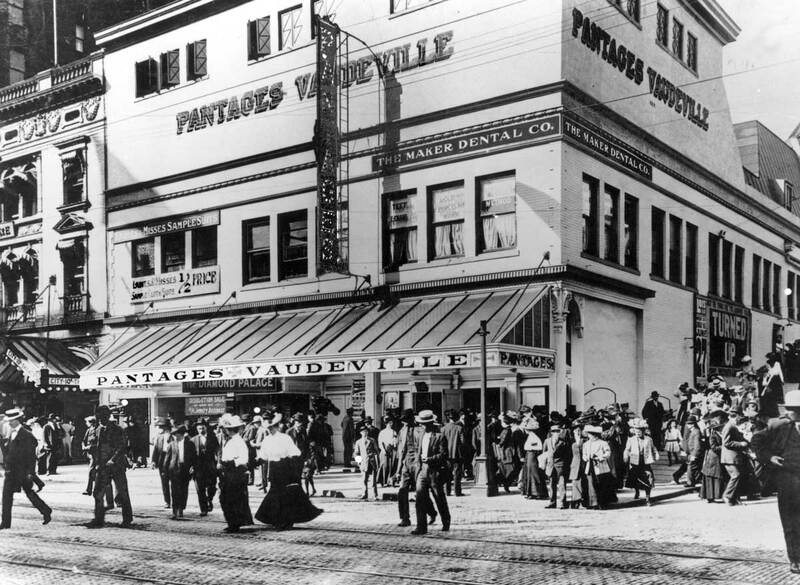 Alexander Pantages built his namesake vaudeville house at the northeast corner of Second Avenue and Seneca Street in 1904. It was “the little Greek’s” second theater. The first, “The Crystal,” also on Second Avenue, was a converted storefront that Pantages opened when he landed in Seattle with a small fortune finagled in the Alaska gold rush. 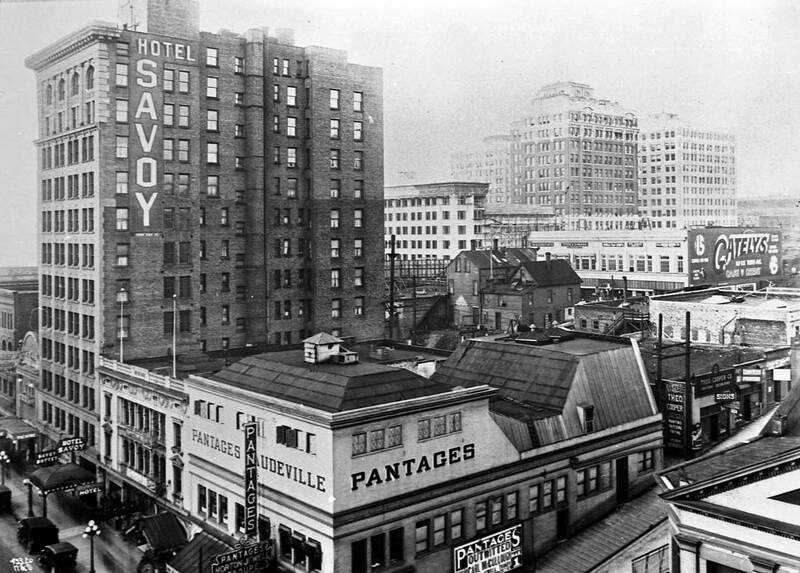 In his Seattle history “Skid Road,” Murray Morgan describes Pantages’ gold-field strategy: “He abandoned his dream of finding gold in the creek beds and concentrated on removing it from the men who had already found it.” Pantages sold the sourdoughs vaudeville, at $25 a seat in his Orpheum theater in Nome. The price of admission to his first Seattle shows was a dime for a mixture of stage acts and short films. Pantages was illiterate, but having roamed the world before landing here he could converse in several languages. His English, it was said, was as bad as any, but he knew what the public wanted. Pantages built a vaudeville empire that ultimately surpassed all others. Somewhat like royalty, his daughter Carmen married John Considine Jr., son of his chief competitor. At its peak the Pantages circuit included 30 playhouses he owned outright and 42 others he controlled. To an act he liked he could offer more than a year of steady employment. Pantages sold his kingdom for $24 million in 1929 – before the crash. Two looks down at the 1913 Golden Potlatch parade on 2nd Ave. The Savoy - part of it - appears in the scene on the left. The year was chosen because the Smith Tower, far right in the right scene, is topped off but not yet entirely clad. The tower was dedicated July 4,1914, Part of the New Washington Hotel (now the Josephinum) appears on the far left of the left panel, at the northeast corner of 2nd and Stewart. Except for the half block north of Seneca Street, together these two views includes the east side of the "urban canyon," Second Ave. from the Pioneer Square neighborhood on the south (right) to the new Denny Regrade neighborhood on the north (left). Both the Savoy and Pantages Lois Theatre - named for his wife - can be found in this look of Second through its intersection with Spring Street. Far right, the Smith Tower at 2nd and Jefferson was completed and dedicated in the summer of 1914. The first run of Potlatches last three years, 1911 to 1913. The photos above were dated 1913 on the evidence of the tower. It is topped-off but not yet entirely clad. 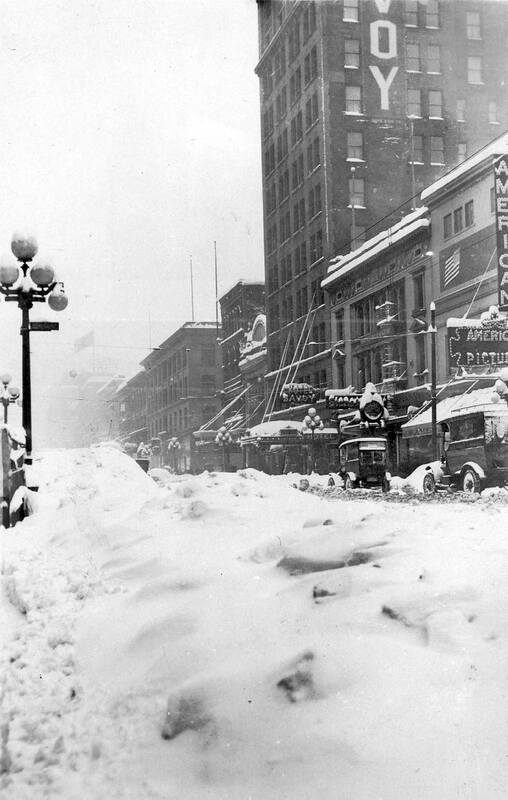 The Savoy rises above the drifts of Seattle's second greatest blizzard, that of 1916. Previous PostOur Daily Sykes #234 – Still In Kansas?Next PostOur Daily Sykes #235 – What Snow is This? Thanks for the plug to my blog. Great extra stuff here. I wish there were more parades nowadays, I mean parades celebrating something or for the sake of indulging in a little pomp. Usually when downtown Seattle hosts a large gathering of people “on the move”, I go home and lock the doors. Is that Pantages’ cakey beauty the Palomar up on Third behind the Gately’s billboard in the fourth-to-last photo or is it too early? Good catch Matt. They appear to be topping off the Pantages in that shot! Good stuff. Love history and what was. I am writing to you Paul to see if you can help me a bit. In one of your photos above is my Great Grandfather Richard T Shannon’s Grocery Store. It was at 1220-1222-1/2 Second Avenue. He also owned the Brooklyn Hotel for a time. Do you happen to know if there are any other photos of this location? 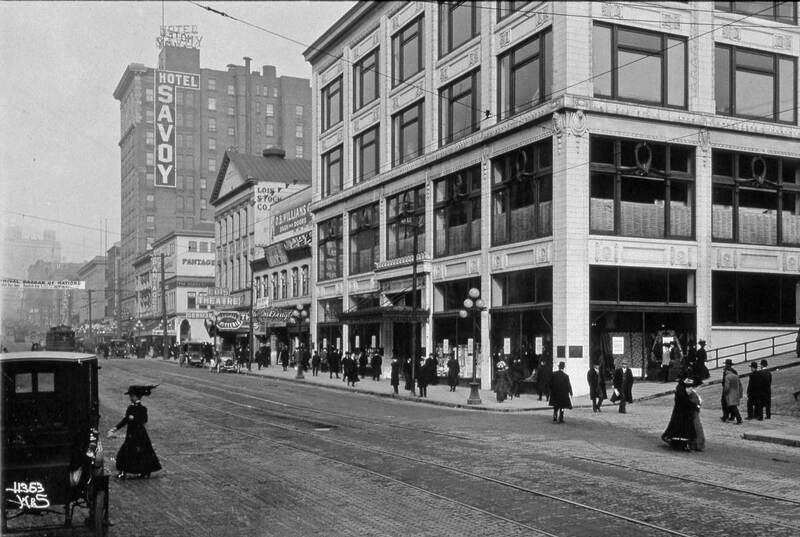 My Great Grandfather had Grocery stores, theaters, and hotels in and around Downtown Seattle. But most importantly at this particular location he was there from 1900-1908/09. Starting off with Shannon Grocery, Shannon’s Boston Grocery, The Central Theater, the Manhattan Theater Company, Shannon Theater, Shannon’s Vaudeville House….Would love to get my hands on some more photos if possible. Thanks for all of your hard work and passion for Seattle History. My mother (who was born in Seattle in 1933) has always loved your work. Have more info on my Great Grandfather and his other businesses if you are interested. I have two wonderful framed fire escape notices from when the old hotel was torn down. “Twelve Stories of Solid Comfort” W.G. King, Proprietor and W.G. King, Jr., Manager. I have a post card of the Hotel Savoy postcard, dated 1908. Post upward expansion I thought would be of interest if I can down load it.